From 4th to 7th December 2014, the International Yoga federation ATMAN is organizing the IV. 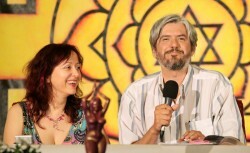 International Congress of Yoga and Alternative Therapies in Romania. The first three congresses brought together a few thousand yoga enthusiasts from over 20 countries who enjoyed a rich and intense programme of workshops, seminars and lectures given by leading Yoga teachers from all over the world. The International Federation of Yoga and Meditation ATMAN offers courses, seminars and workshops in Yoga, Ayurveda, traditional Tantra, Kashmir Shivaism and Meditation in more than 250 locations spread across the globe. The ATMAN federation follows the teaching and spiritual guidance of its mentor Gregorian Bivolaru, who is a living example of the highest realizations in Yoga.